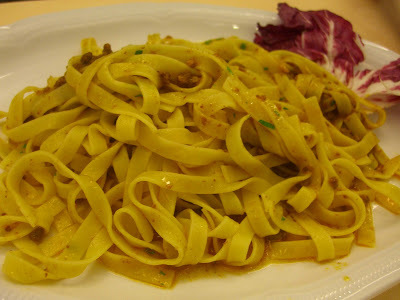 I often hear people say that they love Italy because you can waltz into any ole random restaurant and enjoy an unforgettable, affordable meal chock-a-block with local knowledge and simple, fresh ingredients. After visiting Venice, I must heartily disagree. You see, it IS quite easy to have an unforgettable meal in Venezia. Unfortunately, if you don’t do your research, the meal is much more likely to be unforgettable in a negative rather than a positive way. 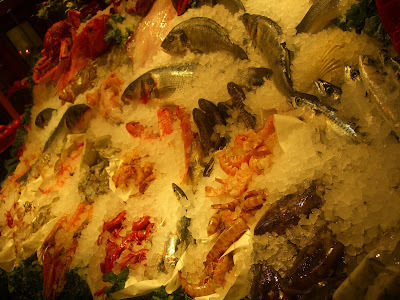 Of course, Venice does have some true gems that serve exotic seafood fresh from the lagoon. You just have to look for them. What first struck me about Venice when I stepped off the train was that there were more 50-something white Americans with potbellies than there are in, well, in America. That’s obviously an exaggeration but the city is overrun with (mostly American) tourists and that means that most of the eateries you’re likely to happen upon while sightseeing are catered to them more than they are catered to the locals. A pattern of high prices, low quality quickly emerged. Thankfully I had gathered as much through my research on Venice’s dining scene and for that reason made dinner reservations months in advance for two of our four nights in the city. Well little did I know that not even through hours of research was I guaranteed a top-notch dining experience. again. And again. And again. After two hours of hungry searching, our frustration mounted and tempers began to flare. Then we finally gave up. This was how we learned that, no matter how precise you think your maps are, no matter how good you think you are at directions, no matter how many cities you’ve traveled to, no matter how many years of combined higher education exist between the members of your party, well, it just doesn’t matter. Venice is confusing. And you are going to get lost. When Phil and I lived in Japan and traveled through Asia, we never ONCE got lost, and we were interpreting street signs and subway signs and maps that were written using languages composed of symbols and pretty pictures and curlicues. 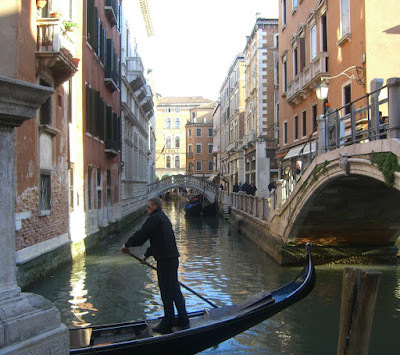 Venice was thirty billion times more difficult to navigate than any Asian destination, period. our stomachs were eating themselves inside out so we staggered half delirious into a crowded place that had a decent-looking menu. Well, all I have to say is, OOOOOOOOPPPPPSSSS. 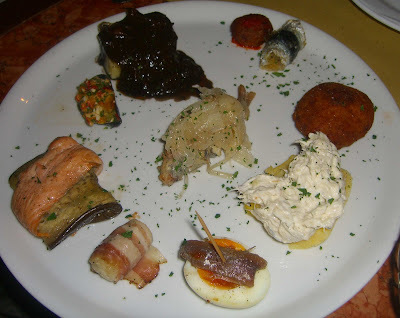 I can’t even remember the name of the place, or what my travel mates ordered, but I will NEVER forget the plate of cicchetti that I got. NEVER. I had read that cicchetti are basically little nibbles that you can find at pubs or as appetizers in restaurants and that they represent one of the last truly local aspects of Venetian cuisine. I expected a plateful of marinated seafood, crostini, olives, and unidentifiable but fresh and delicious other stuff. Well unidentifiable I did receive, but fresh was the last thing on the chef’s mind when he assembled my plate. As you can tell, my usually scintillating sense of humor was not intact for this meal. 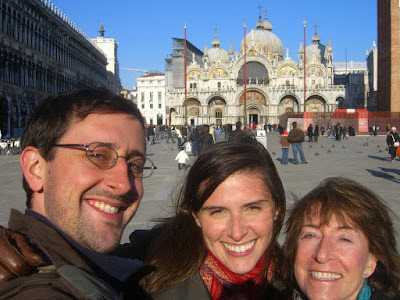 Not having learned our lesson, we stopped for lunch at a restaurant near Piazza San Marco the following afternoon. 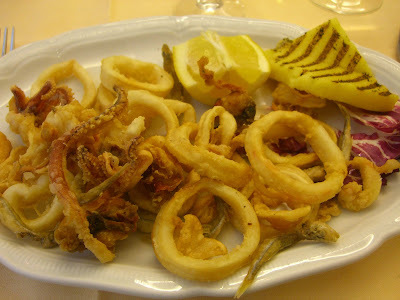 Again I did not take note of the name of the establishment but my fritto misto (mixed fried seafood) was not pulled fresh from the lagoon that morning, rather fresh from the freezer just moments before. And the grilled polenta generously used to garnish my plate was crusted from the goo of a grill that hadn’t been cleaned in my lifetime. 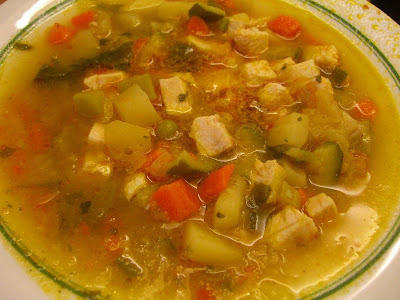 Laurie was happy with her minestrone. But Phil’s pappardelle bolognese was lukewarm, and the sauce it did have was completely bland. Tune in for a much more positive post! Oh no! Venice sounds like it was a disaster, culinary wise! I must say it is contrasting to my visit there six years ago (which is a hell of a long time ago, now that I think about... note to self: re-vist ASAP!) which my family and I enjoyed thoroughly! Lots of quaint cafes and anti-pasto platters, I remember feasting on an unbelievable platter of rustic pork ribs, doesn't sounds Italian, but trust me they were unlike anything I have ever eaten anywhere! Looking forward to the next leg of your journey Cari!